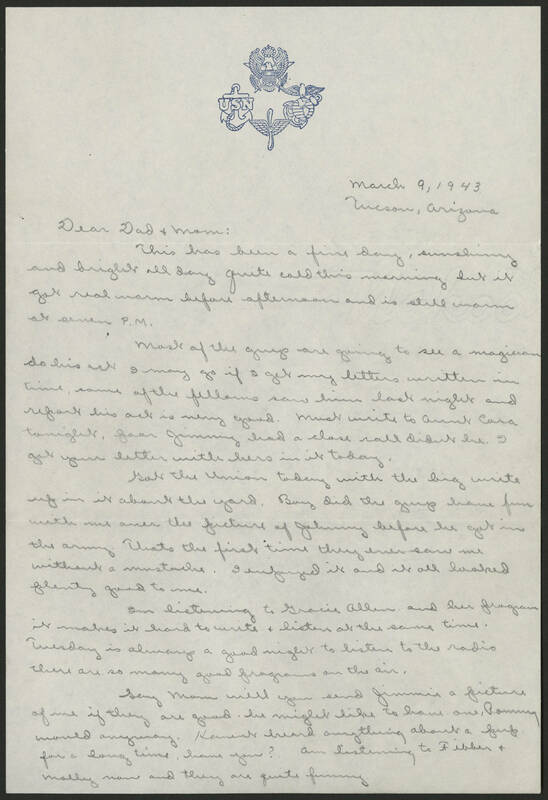 March 9, 1943 Tucson, Arizona Dear Dad + Mom: This has been a fine day, sunshiny and bright all day quite cold this morning but it got real warm before afternoon and is still warm at seven P.M. Most of the guys are going to see a magician do his act I may go if I get my letters written in time, some of the fellows saw him last night and report his act is very good. Must write to Aunt Cora tonight, poor Jimmy had a close call didnt he. I got your letter with hers in it today. Got the Union today with the big write up in it about the yard. Boy did the guys have fun with me over the picture of Johnny before he got in the army. That's the first time they ever saw me without a mustache. I enjoyed it and it all looked plenty good to me. I'm listening to Gracie Allen and her program it makes it hard to write + listen at the same time. Tuesday is always a good night to listen to the radio there are so many good programs on the air. Say Mom will you send Jimmie a picture of me if they are good, he might like to have one, Ronny would anyway. Havent heard anything about a pup for a long time, have you? Am listening to Fibber + Molly now and they are quite funny.